Huge waves crashing over the swimming pools at the Bondi Icebergs Club on a beautiful morning in Sydney, NSW, Australia. Sydney's most famous beach is Bondi. At its southern end is Bondi Baths or Bondi Icebergs swimming pool, an eight-lane, 50-meter saltwater pool built into the cliffs. Open every day except Thursdays, it is home to the Bondi Icebergs Club, which was founded in 1929 by a small group of friends. To become an Icebergs member you must swim three of every four Sundays for five years during the winter (May to September Down Under). It is a true test of dedication, for while outsiders might think that Australia is the land of endless summer, in winter the ocean water is teeth-chattering cold. And on opening day of the winter swimming season, it is tradition that lumps of ice are tossed into the pool to test the hardiness of the competitors. This image belongs to the travel and nature stock photo library. This stock photo of Waves Crushing at Bondi Icebergs is available for licensing for commercial and editorial uses including websites, blogs, books, magazines, brochures and advertising. Restrictions may apply for images which contain third party copyrighted material or sensitive subjects. Photos of artwork are for editorial use only. 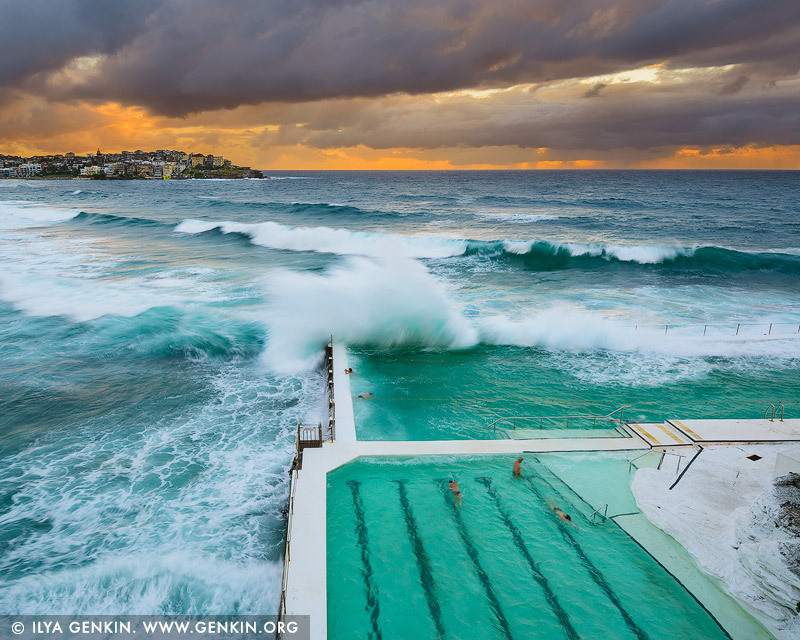 This image id AU-BONDI-BEACH-0006 of Waves Crushing at Bondi Icebergs, is copyrighted © by Ilya Genkin. This is not a public domain image.